This small 1.3 kg convertible (tablet/laptop hybrid) designed for business is rugged and portable. It is built to withstand hard knocks with its scratch-resistant coated magnesium-alloy chassis and Gorilla Glass display. The swivel hinge, which allows changing between tablet mode and laptop mode, made from stainless steel. The keyboard is spill resistant with a drain at the bottom side. 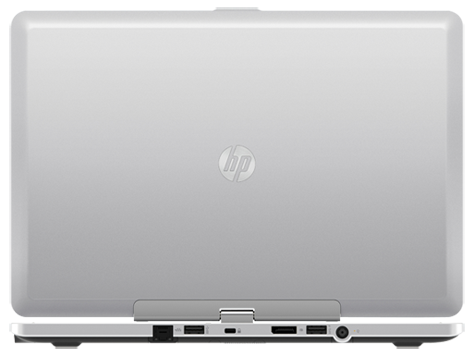 The HP EliteBook Revolve 810 was designed with military toughness in mind and it achieves this with style. The 11.6 inch display offers a resolution of 1366x768, which is suitable for business users who do not need a full HD machine. 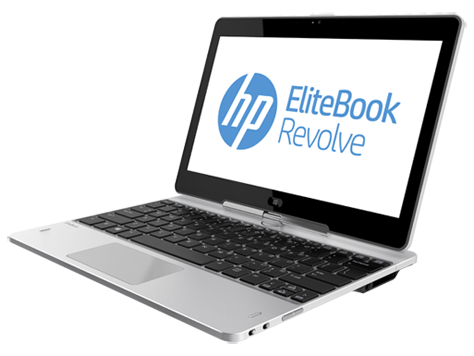 The HP EliteBook Revolve 810 has also been equipped with features that are more commonly found in smartphones. An accelerometer, e-compass, gyroscope and ambient light sensor make life easier and provide a better user experience. Performance is driven by the third-generation 1.9 GHz Intel Core i5-3437U with 4 GB of RAM. This makes it about the same as similar devices out there. Graphics is not eye-catching and gorgeous, but focuses on business and will handle office applications and web browsing tasks well. The Battery life is great and the laptop can easily last over 8 hours with moderate use. 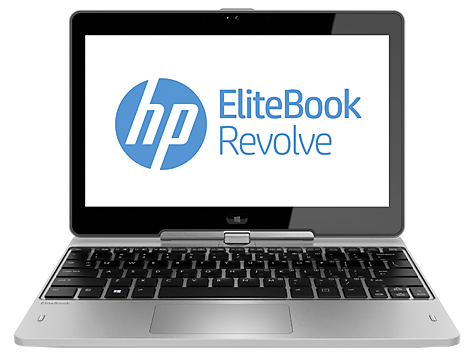 All things considered, the HP EliteBook Revolve 810 is on par with the best of its class. The HP EliteBook Revolve 810 G2 takes the old adage, "If it ain't broke, don't fix it," to heart -- perhaps a little too close. Little has changed here in terms of design, and that's a good thing, though it still doesn't surmount hybrid laptops' biggest hurdle. Aside from hopping onto Haswell and adding room for tons of RAM, this convertible laptop hasn't changed enough on the inside, either. A sharper display would help the EliteBook Revolve catch up with the full HD competition at the very least. We'll see whether this hybrid laptop stacks up regardless in our full review. HP hopes its EliteBook Revolve 810 will stand out from the crowd, but with prices from £1,642 (including VAT), it doesn't offer value for money. We think many businesses would rather pay less money for a brand new Yoga Pro 2 or MacBook Pro, which will have longer battery life and better display. 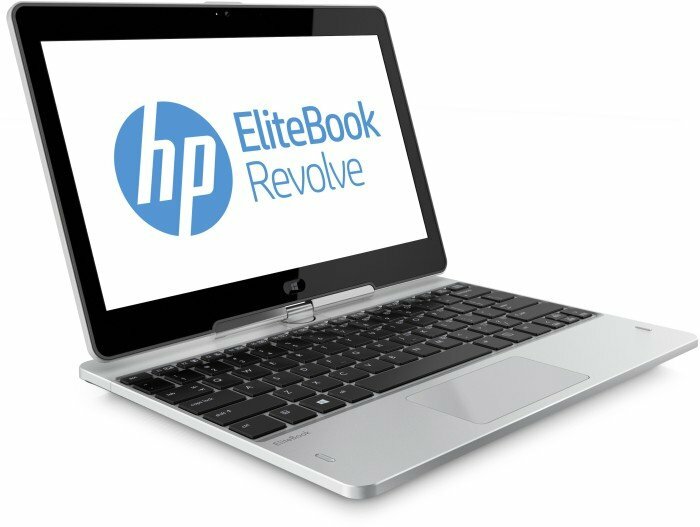 As hybrid devices go the HP EliteBook Revolve 810 is a solid choice for businesses in need of a high-performance hybrid tablet-ultrabook. But with even the most basic version costing a hefty £1,368, the top-end performance comes with a premium price tag. As it is based on the previous generation of Intels' Core processor line, the Revolve also offers less than a full working day of battery life, meaning it's not ideal for businesses seeking to kit out workers who spend most of their time on the move. HP's convertible ultrabook does offer a few unique features including a more rugged and durable construction for the EliteBook Revolve but it is held back so much by its pricing. The system does offer some impressive storage performance but the storage space is a bit limiting and the bright display is hampered by its lower resolution. The Revolve proves there’s still life left for durable business convertibles. While its prime competitor is Lenovo’s ThinkPad Helix, the two devices are actually very different. The Helix is thinner, offers a fully removable display for more convenient tablet use, and lasts longer on a charge. A long time ago, laptops used to very occasionally convert into tablets but we never made a big deal out of it. HP’s EliteBook Revolve 810 is a good first step toward a very portable business laptop-tablet hybrid, but lack of a killer battery life hurts it. 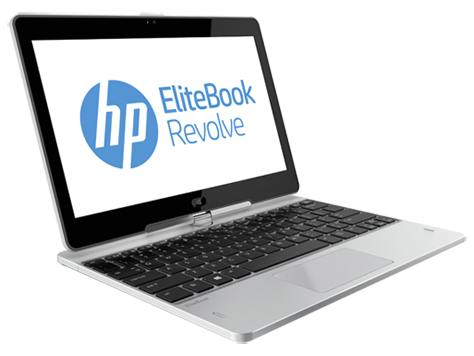 A convertible tablet for the business set, the HP Elitebook Revolve 810 applies the Elitebook’s design sensibilities—rugged industrial-strength construction, business tools like vPro—and applies them to the latest trend of small, portable Windows 8 convertibles. 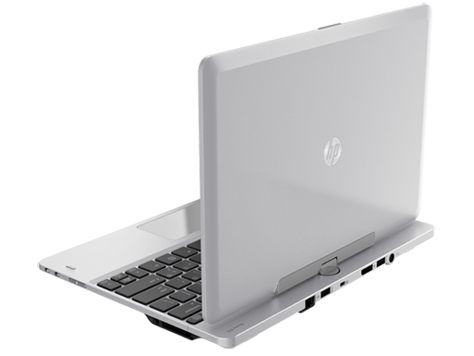 The HP Elitebook Revolve 810 combines industrial-strength construction with portability and convenience, making it a solid convertible laptop for the business user on the go. If your business use demands the convenience and portability of a tablet, but can't afford to sacrifice durability and business features, the HP Elitebook Revolve 810 is a solid performer with rugged construction and a business-minded feature set. Whether it's as a tablet or a laptop, it provides a blend of productive capabilities and business-focused features that put it on par with the Editors' Choice Microsoft Surface Pro. As for the EliteBook Revolve, at first glance its $1,449 price looks steep, particularly with Lenovo offering a ThinkPad Twist for $1,079 with a comparable Core i5 and 128GB SSD. But when you begin to add up the 810's charms—sleek but rugged chassis, simple yet versatile design, comfortable keyboard, strong application performance, long battery life, enterprise security features—it begins to look more reasonable. 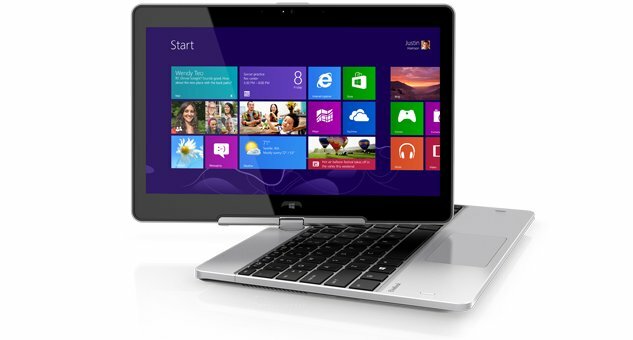 The design of the EliteBook Revolve 810 has a magnesium and aluminum chassis that has a soft-touch finish. It makes the laptop both comfortable to hold as well as sturdy too. The silver finish hides fingerprints and looks sleek. It measures 11.2 x 8.4 x 0.8-inches (wdh) and weighs 3-pounds, so it's lighter than your average notebook but heavier than a tablet. So the size and weight of the Revolve 810 is another reason that it falls right between conventional tablets and laptops. When you use the laptop as a tablet, it does feel very thin for its size. Positive: High-performance; optional plug-in equipment; Possibility to connect to a docking station. Negative: Battery life could be improved; Swishing sound of the fan. 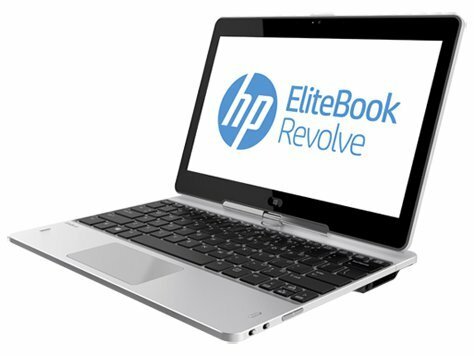 The HP EliteBook Revolve 810 G2 one of many hybrid laptops out there in the market today. It separates itself with its swivel-hinge that turns the screen to change into tablet mode. One thing for sure is that you'll be getting a lot of power in this offering by HP. With options of 4th-generation i3, i5 and i7 and at least 4 GB of RAM (upgradeable to 12 GB), running most applications and multitasking is not a problem. It also comes with an SSD up to 256 GB, ensuring extremely fast boot up and software startup. The Intel HD 4400 graphics will grant you excellent media playback and you can play some of the less resource hungry games. The 11.6-inch Gorilla Glass 2 screen has a 1366 x 768 resolution, which is one of its main drawbacks. Most laptops at this price comes with 1080p FullHD resolution. The keyboard is spill-resistant and has an optional backlight. It's been tested by HP for dust, shock, temperature and water resistance as well. The price is very steep, so not having 1080p resolution is a let-down. The battery life is somewhat below average. This is not exactly the best value for your money but you are guaranteed to get performance. While HP might not have been present in the tablet space for all that long — paging the Touchpad, anyone? — recent efforts by the company show it returning to form. Indeed, it’s doing it again in the Revolve, which not only revives an older tablet style, but also makes it durable and useful for longer distance, which will suit business users getting ready to travel. Overall, this is a good unit that performs both notebook and tablet tasks without much compromise. It’s comfortable to use as a notebook if you don’t mind the 11.6in form factor, and it’s equally comfortable to use as a tablet if you don’t mind the overall weight being significantly more than a stand-alone tablet. You get good performance and battery life, decent connectivity, and the port expansion option is useful for office docking. 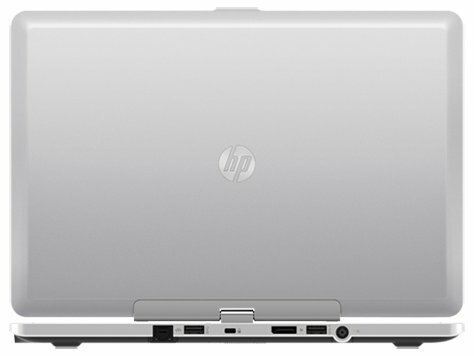 The HP EliteBook Revolve 810 G2 is a portable powerhouse that mixes excellent battery life with impressive performance. I found that it worked better as a laptop or presentation system than a tablet or fold-flat system; in addition, at more than a half-pound overweight, it's tedious to hold as a tablet. And even the entry-level models are surprisingly expensive compared to the competition. Frankly, I was wowed by the Dell XPS 11's ultra-high-resolution screen, its sleek profile and low weight. Easily the best of the bunch at being a tablet, the XPS 11's soft skin is inviting to the touch. Finally, despite having the most complicated hinge design of the three convertibles, the Sony Vaio Fit 11A | Flip PC offered the least number of movement configurations of the three laptops. As a tablet, I found it awkward to hold vertically, while as a laptop, the screen wobbled noticeably and the volume control is hidden behind the display. The Flip does, however, have a nice 5-degree tilt when it's set up on a desk as a tablet. Positive: Quality materials; special hinges; excellent keyboard; good price. Negative: Glossy display. Positive: Amazing appearance; interesting idea of conversion; good creen; 3G connectivity. Negative: High price; mediocre autonomy.